With a cheerful smile, an affectionate look and a natural sense of humour, Ms. Tran My Linh delivers not only useful knowledge, but also joy and comfort through every lesson of hers.First time seeing her, only a few people may think she is a teacher, because every look and every act of hers are always full of youthfulness and enthusiasm. 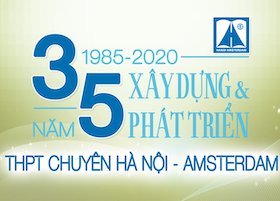 This Vietnamese Teachers’ Day 20th November, let’s listen to Ms. Tran My Linh’s sharing - an alumnus (year 11-14) and also a teacher experiencing the first 20th November in her teaching career. Interviewer (I): Hello Ms. Tran My Linh! Can you share with all of us the reason why you took the decision to become a teacher? I chose to be a teacher due to many reasons. My mother is also an English teacher, she is a keen supporter and an inspiration of mine. Furthermore, later on, while teaching, I have the chance to meet a lot of pupils who are genuine, curious and passionate with studying English, and my bond with this job, therefore, grows even more. I: Can you tell us how you feel about experiencing your first 20th of November as a teacher? 20/11 this year is much more meaningful to me than 20/11 in the others. This year, beside visiting my former teachers, I also received a lot of kind wishes and wonderful flowers from my dear pupils for the first time. To be honest, I felt deeply happy. Let me tell you a little memory: first time seeing me, the parents were really shocked because they didn’t think I am a teacher since I look so young. I: How do you feel about returning to your old school in a new position? My feelings were hard to describe when I knew I was able to return to work for my school. I believe, every student who has had a period of time bonding with this school would feel like coming back, for Ams is more than a school, it is a home. I feel very glad and lucky for myself to have an opportunity to come back to Ams, to work in a professional yet friendly environment, to gain teaching experiences from specialist teachers and to teach students who are really intelligent, active, curious and supportive in class. I: As far as we know, you stood on the podium immediately after graduating, so what kinds of experience or feelings has that brought to you? Standing on the podium right after graduation to me has its pros and cons. Its pros are all the specialized knowledge I have acquired throughout my learning years has been applied into reality really soon. I also try to search for new methods and materials to make the students feel more keen on English language. Moreover, the gap between my age and their ages is not too big, thus I can get what they feel inside and they also feel more attached to me. However, I still need to gain more experience in teaching and managing the class. I: Can you tell us how Teachers’ Day nowadays differs from Teachers’ Day of the years when you still went to school? I can say Teachers’ Day before and now don’t differ a lot. This is an occasion for the students to express their feelings for their teachers. It can be as simple as some wishes, some songs or a little flower bouquet, they are not worth the money but definitely worth the meaning. I: Do you have any advice or recommendation for the students who have the intention of pursuing teaching career? I think, if you love children and have the passion to convey knowledge as well as your own inspiration to the students then you should take a chance to become a teacher. In my opinion, the more I teach students, the more I love this job and I especially like meeting adorable and curious students. Obviously, in the beginning there can be plenty of struggles and you should get prepared to overcome and bond with this job. This Vietnamese Teachers’ Day, I wish you and all the teachers in the school happiness, health and great success in this teaching career!